Hand In Hand: Gorgeous Blogger?! / Exciting News! Gorgeous Blogger?! / Exciting News! Krystal gave me an award! Wow, this is my third award! Is it sad how excited I am?? Thank you Krystal!! •Accept and thank the person who gave it to you! •Then pick ten people to give this lovely award to! I have this weird thing where I have to use lotion right after I wash my hands. I hate the feeling if I don't. I also lotion everything after I shower every day. I love lotion! I'm a dog lover without a dog! I can't wait until we can get one or two! 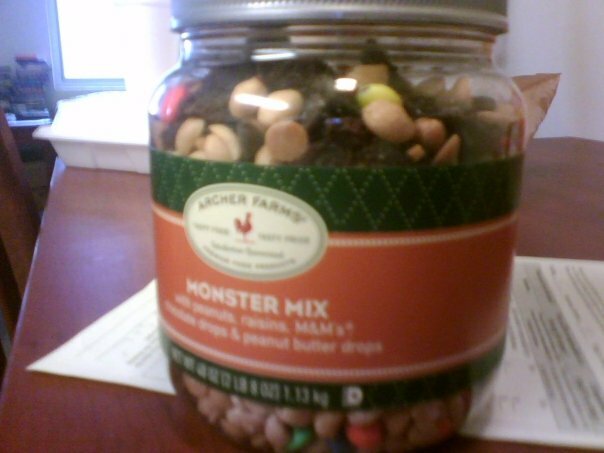 I love the trail mix from Target. I can eat it all day. I had braces in junior high and now wear a retainer almost every night to keep my teeth straight! I have nightmares sometimes that my teeth are falling out. Or that my retainer is breaking into tiny pieces and I can't get them out of my mouth. Gross. I'm a bit shy but it's conditional. I am not shy online, but if I were put in a room of people I don't know then I would sit/stand there uncomfortably until someone approaches me and makes conversation. I also get baby crazy sometimes. I worked at Dairy Queen in high school. Best. Job. Ever. just because of all the "free" treats! I had a friend who worked at Hollywood video and another friend who worked at Wood Ranch so on the weekends after we all got off work, we would have free movies, ice cream, and food! Good times. Nightmares. I have them way more than I should! Not having a regular schedule with Michael. I wish we were like most couples and that we got to see each other every night and on the weekends! Kayla from Sense of Style is Eternal. Ashley from For The Love of Shoes and a Baby Too. Katie from Life in the Fulmer Lane. Bella from Life with Mr. and Mrs. Z.
Annie from Our Little Family. And can I just say how glad I am that today is Friday?! Man, this was a rough week! Oh. And Blogger has been acting kinda weird lately. It won't show me all the blogs I follow and it sometimes doesn't let me add comments when I am moderating! Sad! I have some great news!! Michael told me last night after I cried that I have to wait for everything I want that if we get an apartment with enough space and a back patio, then we can FINALLY get a doggy! I'm so excited! I'm also being a little cautious though because it seems like every time I get excited and my hopes up, they are false hopes! But the fact that he finally caved and is letting me loose on the doggy hunt...it makes me a very happy gal!! Have a great weekend! I know I will!! Awww, thanks so much!!! I heart the comments you leave on my blog. And yay for the puppy news! Do you know what kind you want to get? Thanks so so much! I'll try and come up with good stuff for the blog world to know!!! HOORAY for a puppy. I'm dying for one. I know what you mean about Blogger. I'm almost 100% positive that I hit follow the last time I came to your blog. Anyway, I hot follow again. You guys are so cute! I love that you have your first pic as a couple here! Thanks so much for visiting my blog on my SITS Day! I hope you will stop by again soon. Thanks Shelley! I'm so excited! Two awards in one week - stop me now! Oh I'm so jealous you're getting a dog! I want one sooo bad too. Yay for you! thanks sweet girl! i'll be posting about it soon!!! I hope you get a place where you can have a dog. I want one really bad too but I live in a condo where currently we have 6 cats... yah don't worry im not a crazy cat lady. My one cat had 4 kittens so in 3 weeks I will be back down to 2 cats. I must say I am quite surprised that you want to get brest implants...mainly because your Mormon... I want breast implants one day too... not too big just I dont want to be so tiny anymoe, I hear you. 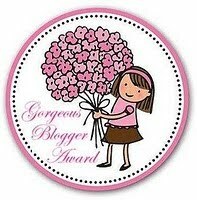 aww thank you for the award Shelley, it made my friday :) your blog is so cute. i am happy for you that you can finally get a dog! have a good weekend!! Ok, now I know why I wasn't getting your updated posts. My reader doesn't show that I'm following you. :( Weird. I am right there with you on #6. I do much better online. I will kill spiders for you. Oh yeah, dumb drivers are the pits. I think Blogger has been messing with us all lately! Doesn't it know we need a break? Ah ha ha. Congrats on your award! Super cute blog! Yay for awards! Hi again! I've just been kind of sifting through your blog and I had to tell you we are weirdly very similar haha! We're the same age, I also worked at DQ in high school and ate my weight in ice cream. I'm a list maker, have random bouts of baby fever and am a dog lover without a dog! It will be my first order of business to adopt one when my fella and I finally buy our house and get out of our tiny apartment.